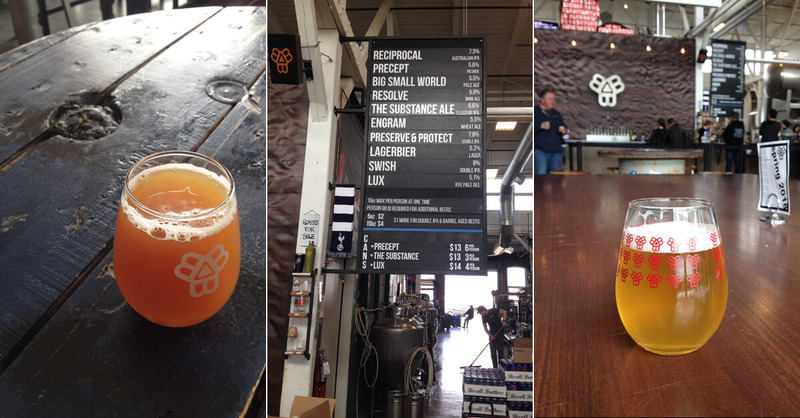 Beer lover's guide to breweries in Portland, Maine • Where Is Your Toothbrush? Portland, Maine has a thriving craft beer scene. Its 18 breweries make for a 2.5 times higher brewery density, at approximately 1 per 3,900 residents, than the Pacific Northwest Brewvana (in fact, Forest City is the #1 American municipality for breweries per capita). 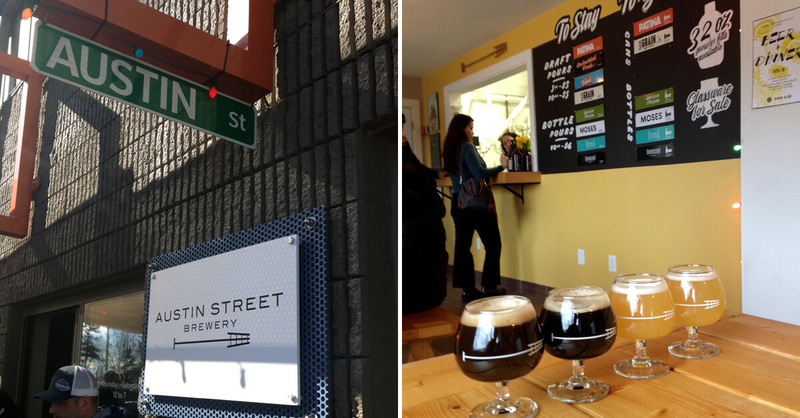 Maine’s largest city’s neighbor to the south, South Portland, boasts another four breweries. 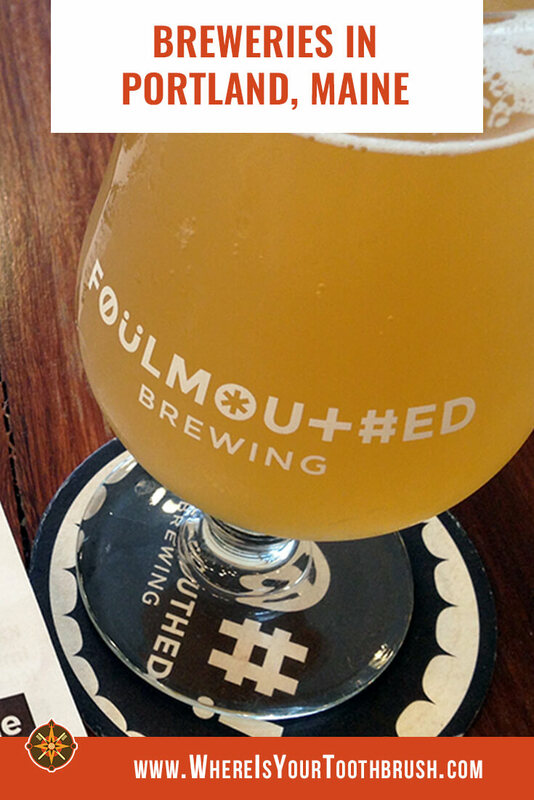 This comprehensive list of breweries in Portland, Maine (and South Portland)* is the result of excessively intensive, existentially taxing, and extensive field research. * This guide has been updated for 2018. As of April 2018, there are 18 breweries in Portland, Maine. 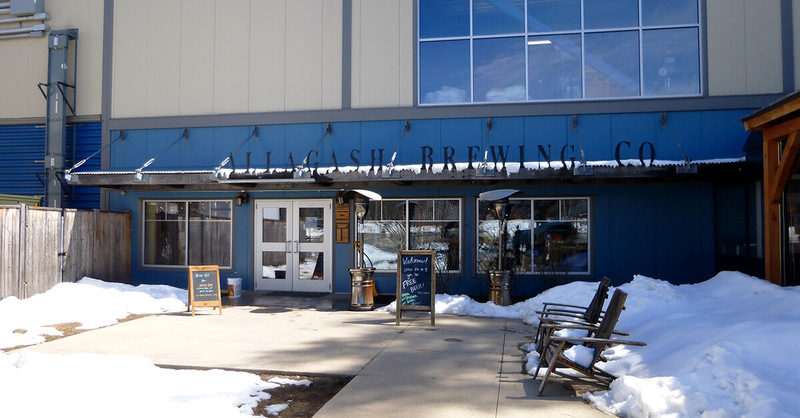 Allagash is one of the oldest and best breweries in Maine, brewing since 1995. Their Belgian-inspired beers are widely available and popular across the state and beyond. The tasting room is on premises at the brewery and also serves as the start/end point of brewery tours, which are no longer free. You can’t drink a full pint but the friendly staff will offer you a free flight of four (and excellent restaurant recommendations, if you ask). The flagship White (5.1% ABV) was the very first brew released by Allagash and also the very first we had in Maine. As we sipped this pleasant take on witbier, we waxed nostalgic over the memories of the Netherlands where we enjoyed wits at canal-side patios on sunny days. While the White lacks the bite we associate with wits, the wheat (rather than barley) malt base and orange peel and coriander additions make it quite refreshing. Even better: It came served with a healthy dose of sunshine melting the snowbanks from a storm a few days prior. The rest of the Allagash beer flight rotates. On our visit, the Saison (6.1% ABV) was again not as pronounced in terms of the ‘saison-ness’ as expected, but, being somewhat new to the style, we didn’t mind. We couldn’t handle the tartness of the Windfall (6.1% ABV), a Brett, which must be one of our least favorite styles. But Map 40 (7.5% ABV), a stout, was just about perfect: rich and creamy with a medium body, yet refreshing with the pick-me-up of cold-brewed coffee it is blended with. 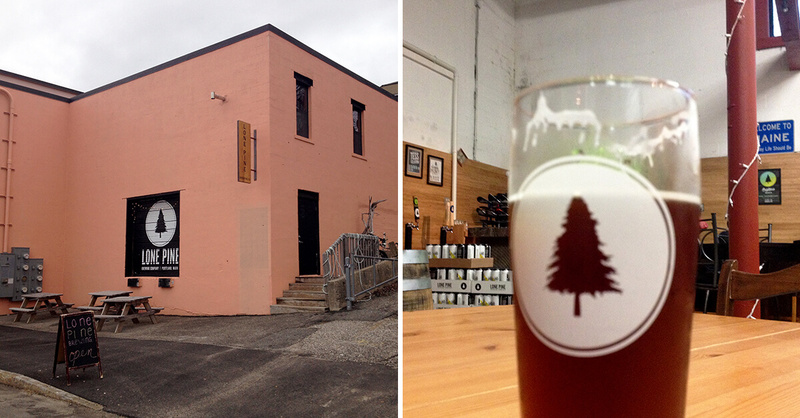 The only thing missing at this Portland, Maine brewery was a fireplace. Hours: Daily 11:00 a.m. to 6:00 p.m.
A stone’s throw from Allagash, Austin Street Brewery is in the same industrial office park building as Foundation Brewing and Battery Steele Brewing (see below). On a sunny spring Saturday, it’s madness: droves of youthful, puffy-vested beer lovers flood the warehouse spaces and roped off patios out front to imbibe. Who knew hanging out at warehouses was so hot! Come on a weekday or in bad weather for a seat in the tiny tasting room and personalized attention from staff. Hear the story of the Bennu Coconut Stout (8.1% ABV), for example, a tasty, well-balanced dessert-like brew made by all the women who work at the brewery, including the head brewer Lisa Kellndorfer. The other dark ale on the small list, Six Grain Milk Stout (6.4% ABV), has just the right lactose bite beneath a solid body. By contrast, the light-colored brews disappointed us. Patina (5.3% ABV) is a hazy brew, juicy and hoppy in a way that you’d never know it’s an American pale ale if the label didn’t say it. The same goes for the Industrial Park Ale (9%), an experimental double IPA that’s so strong and overwrought it would have won Oregon’s hop wars of yore. On our first attempt, a Sold Out sign greeted us at Battery Steele Brewing’s door; the tiny new Portland brewery is just that small and that popular. Luckily there are two other breweries to check out in the same building (Austin Street, see above, and Foundation, see below). Cue lines out the garage door on a sunny, crisp Saturday and the tiny space and roped-off patio crammed to the brim. Named and branded after a military installation on nearby Peaks Island, Battery Steele seems to have hopped on the hop bomb wagon (just to underline the point, the beer list includes the hop varieties each beer is made with). Fifth in a series, the hazy OnSight #5 (Double?) IPA (8.3% ABV) is so aggressive, citrusy, and resin-y it’s hard to tell it’s an IPA. As we point out throughout this article, the lack of nuance in hazy beers leaves us unimpressed; what’s the point, it you can’t taste anything but the juice? Case in point: the Avalon Double IPA (7.5%) is less boozy than the IPA but, being cleaner, you can actually taste something other than the juiciness. That it’s triple dry-hopped helps all the notes stand out, too. It’s a decent specimen of the style, albeit not suited to being drunk in the midday sun. Even after 2-ounce samplers of these brews we were so hopped out we decided to forgo the Flume Double IPA (8% ABV) and Endless Ride Kettle Sour (3.7%). Bissell Brothers is located at the southwestern corner of the peninsula, in a refurbished warehouse at Thompson Point, an up-and-coming neighborhood accessible via a walking/biking trail (among the businesses in the complex is the Cryptozoology Museum). Inside was human mayhem: people curl through airport-style tape barriers dividing queues for can purchases and for drafts and crowd around long communal tables and rounds furnished from oil barrels. Loud pop rock on the stereo compounds the noise. Hazy or New England IPAs rule here (and they are a hit in Oregon, too). We had stumbled upon The Substance Ale (6.6% ABV), one of “the most talked about beers in the state”, at Salvage BBQ. Danky and bright all at once, the hazy yellow brew went really well with a chopped brisket sandwich, and pointed to the fact this style goes best with food. At Bissell, Lux Rye Pale Ale (5.1% ABV), too, underlined the issue we have with hazy beers: the juiciness suppresses the subtle flavors of beer. The rye bite we appreciate about rye ales was completely non-existent and totally overwhelmed with the suspended yeast flavors. Hazy is to regular IPA is like Sturm/burčiak (new-young wine) is to mature wine: not even close. Luckily for our old-school taste buds, Bissell’s lineup also features Precept Pilsner (5.6% ABV), which gave us a little taste of Central Europe. A bit hoppier and boozier than the Pilsners we’re used to in the Old World, Precept does everything right otherwise. Bissell Brothers: come for the hazy hype, stay for the lighter type. 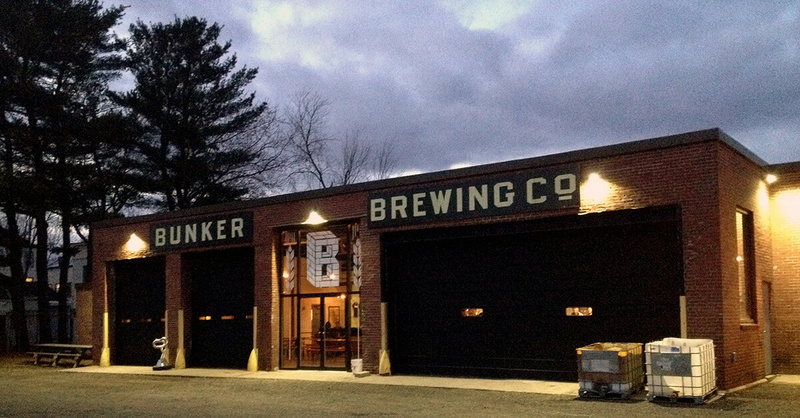 Breweries in Portland, Maine: Bunker Brewing Co.
Bunker is literally on the other side of the tracks, off Congress Street at the end of a dirt driveway round back of a multi-unit warehouse building. Recently relocated from East Bayside, where some maps and guides still place it, its beer hall-style tasting room is homey and welcoming the way a mountain chalet can be at the end of a long hike. Though they offer ales as well, this brewery in Portland, Maine is really strong in lagers and Pilsners and we went for those. The Machine (5.2%) is the closest we had to a true Czech Pilsner in Portland, ME breweries. Made with traditional Saaz hops and crisply carbonated, it supplied a taste of the faraway home. Salad Daze (4.7% ABV) is a German-style lager made with Citra hops for a refreshing and surprisingly citrusy brew. The Cypher India Pale Lager (6.4% ABV) was our first taste of Eureka hops, and a dank, hoppy sendoff into the cold Portland night. Salad Daze, all in my brain. Hours: Monday–Thursday 2:00 p.m. to 9:00 p.m., Friday–Saturday noon to 10:00 p.m., Sunday noon to 8:00 p.m.
Conveniently located down the road from Allagash (Austin and Foundation are on the same street), Geary’s is the oldest craft brewery in Maine. In 1983, when it started, there were only 13 microbreweries in the entire country (there are over 5,300 today). 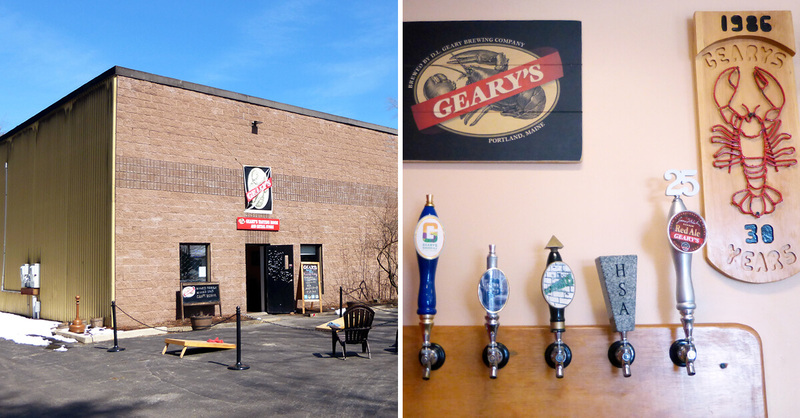 A month before our 2017 visit, the Geary family sold the Portland, Maine microbrewery, a response to the same market pressures old breweries in Portland, Oregon, like Bridgeport, have faced. As befits the founders’ inspiration and training, the brews made at Geary’s comprise mostly English-style ales. While they come with that old-school feel, they are fine exemplars of their respective styles. The Pale Ale (4.5% ABV) is a middle-of-the-road English pale that would wash heavy food down well, as would the Irish Red Ale (4.8% ABV) dessert with its caramel notes. The Winter Ale (6% ABV) and Hampshire Special (7% ABV), a chewy, sweet English Strong Ale, served as reminders of the winter past. 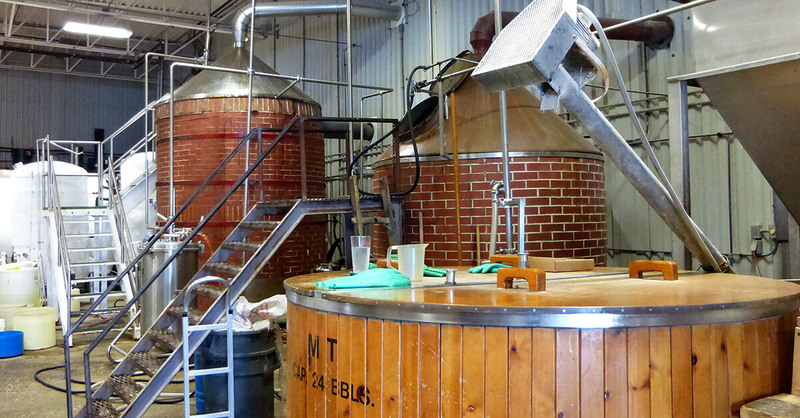 The highlight of our visit: a peek inside the brewery, with unique brick-walled fermenters and a wood-walled mash tun. Foundation Brewing is the first brewery you encounter on Industrial Way, located in a warehouse complex that also houses Austin Street Brewery and Batter Steele Brewing (see above). The tasting room has that cavernous warehouse feel with large tables you would expect at an industrial park location but once it fills up, it gets tight. The Everlong Hoppy Pale Ale (5.5% ABV) lives up to its name in being surprisingly hoppy, and it walks just this side of hazy life. Even though the brewery is only 4 years old, their ales are widely available in restaurants and bars around Portland; they’re just that good. We sampled the Afterglow IPA (7% ABV) at Eventide Oyster Company, to accompany the famous lobster roll. A bit hazy and very hoppy and dry in the finish, Afterglow is one of those big brews that make you thirstier as you drink them. 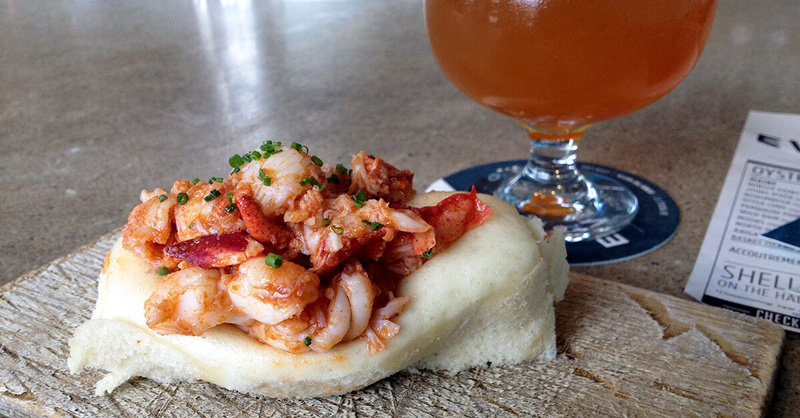 Foundation Brewing’s Epiphany IPA playing second fiddle to Eventide Oyster Company’s lobster roll. Enter the small taproom of Goodfire Brewing, at the back of the building housing Lone Pine Brewing, on a day of a beer release as we did of the Tri Combs Double IPA (8% ABV), and you’ll find yourself in a cramped, bustling space. A few tables fill up quickly; Portlander after Portlander hauls cartons of cans out; and the pop-up Japanese restaurant in the corner infuses the room with decisively non-beer fragrances. Our favorite bit was the design of the posters serving as the beer list. This because once again, as with the other new brewery in town, Battery Steele, hazy beer leads the way here. Luckily, the lineup also included a lone lighter brew. The Their There They’re Noble Pilsner (4.2% ABV) was the lightest, cleanest of the pilsners we tried on the 2018 tour of Portland microbreweries. True to the tongue-in-cheek description, it did cure what ailed us at the time (a hazy IPA overload), becoming a sort of a palate cleanser. 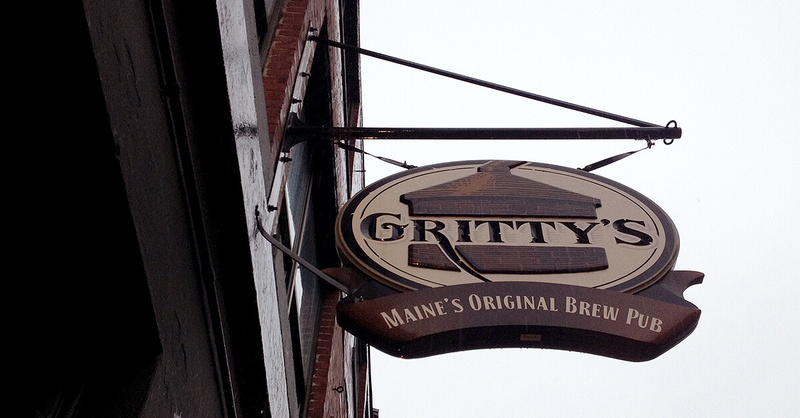 Gritty’s is another old Portland brewery, established in 1988. We reached its original Old Port location—Maine’s first brew pub—in the middle of a rain storm; its spacious English-pub brick-and-wood interior, heartwarming English-style ales, excellent service, and Grateful Dead cover band made for a haven for us, who had once dreamed of sailing the great seas with the children of Captain Grant. A haven from a storm. We picked two rotating beers from an extensive list. The Chocolate Porter (6% ABV) left us wanting for a little more chocolate and body. The S.O.S Special Oatmeal Stout (6.8% ABV) was a decent tangy and dry stout whose first batch in 2013 had been made to celebrate Gritty’s 25th anniversary. As we usually find in English pubs, the place makes a better impression than the beer. We hoped to return to Gritty’s to sample more of their offering and hearty food, but ran out of time. 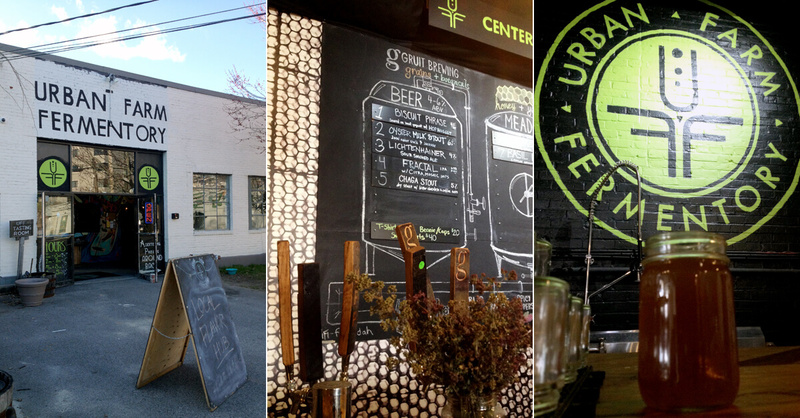 Urban Farm Fermentory puts out a range of fermented beverages: beer, mead, cider, kombucha, and jun, all produced using local and foraged ingredients. Like the commuity of fermented brews, the taproom, located in a warehouse near Lone Pine and Goodfire breweries, has the comfortable feel of a community space. Where in breweries the common sight is people carrying out cans of newly released beer, here the thing is sampler trays of the various beverages. Though Gruit Brewing, UFF’s beer-making operation, specializes in the eponymous historic German style brewed not with hops but with various other plants, including “herbs, roots, flowers, fruits, vegetables, and leaves [and fungi that the brewers] forage, source locally, or grow in [their] garden,” our sampler flight did not include the style. Instead, we tasted a range of other unique beers. The Biscuit Phrase Elderberry Belgian Dubbel (3.5% ABV) is so sour it doesn’t taste like beer, but then we are not fans of sours (not yet, anyway). The plus: it was our first beer soured on yogurt. Similarly, the Lichtenhainer (4% ABV) is a sour smoked ale. Smoked and sour indeed. 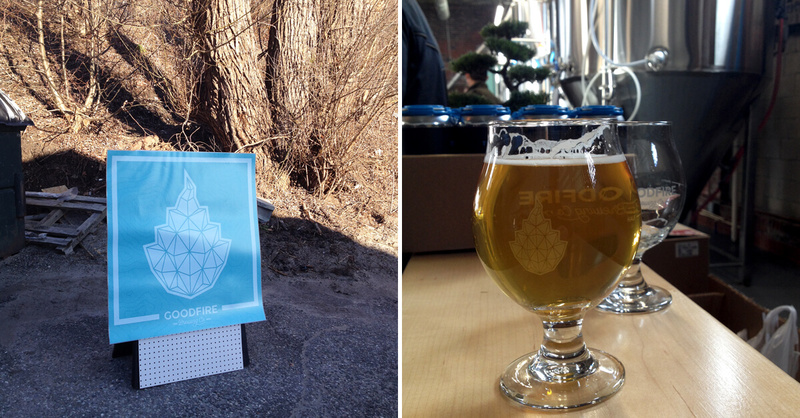 Fractal IPA, made with spruce tips, is like no IPA we’ve ever had; in fact it tastes nothing like IPA. Or beer, even. The two stouts helped squash the heartburn we developed from the first three brews and replace the bad taste in my mouth with delightful dessertiness. Where the Oyster Milk Stout (6% ABV), made with local oyster shells, has a briney undertone befitting Portland’s maritime spirit, Chaga Stout (5% ABV) is dry with notes of dark chocolate. A shot of mead delivered the sweetness we craved after all the fermented flavors. The Fermentory is for the beer connoisseur seeking edgier product; beginner and intermediate beer drinkers (like us) may want to look at more traditional breweries around Portland. Hours: Tuesday–Saturday noon to 7:00 p.m., Sunday–Monday noon to 5:00 p.m.
Breweries in Portland, Maine: Liquid Riot Bottling Co. If you visit Portland, Maine, you’ll inevitably end up on Commercial Street, a harbor-facing thoroughfare with seafood restaurants and ferry terminals—and Liquid Riot Bottling Company. You’ll get a twofer there: it is both a brewery and distillery, both of which are on view behind the bar. While we didn’t sample any of the hard stuff, they know what they’re doing when it comes to beer. Get ready for a tasty, tasty experience. It was tough to pick from the 17-strong list. They were out of our first choice, Shaka Zulu (5.6% ABV), a Nordic Blonde made with South African hopes and Maine oats. Instead, we went with the Intergalactic India Pale Lager (6% ABV). A fairly uncommon style, IPLs are hopped like IPAs and yeasted and aged like lagers, which often results in beers that are neither here nor there, with the best of both worlds lost in translation. But, like Bunker’s Cypher, Liquid Riot’s Intergalactic manages to retain the good of both styles, fusing them into a hoppy lager / light IPA delight. Even stronger, Zombie Bunny (6.6% ABV) is an excellent Helles Bock delivering a malt-forward sweetness on the back of Mandarina hops. The rest of the impressive lineup will have to wait for another time. Though we regret to say that we came here once, we confidently declare Liquid Riot to be one of the best breweries in Portland, Maine. Lone Pine sits at the top of the section of East End nicknamed Yeast Bayside for all the breweries located there (I also heard it called Yeast End). With friendly staff and board games, the unassuming, small tasting room reminded us of a common room at a hostel or dorm. It being the end of a walk-and-drink brewery tour around Portland, we only sampled a lone brew. The limited-edition Samara Maple Brown Ale (7% ABV) is a lovely specimen with strong notes of added maple and coffee, a liquid dessert to top off the day’s walking-and-drinking adventures. We wished the food truck that sometimes parks outside were still there to tide us over to another sampling. Breweries in Portland, Maine: Oxbow Brewing Co.
Farmhouse ales are the most recent addition to our beer-drinking repertoire. We are finding the learning curve to be even steeper than that from Pilsners we accustomed to in Europe to IPAs in the Pacific Northwest. We should have come to Oxbow in Portland, Maine to take lessons. Come hither, the gateway to farmhouse ales is open. Specializing in farmhouse ales, which originated in rural areas of France and Belgium, and presenting them with an urban twist, Oxbow’s brewery is located in Newcastle, Maine. The Portland facility focuses on aging, blending, and bottling. 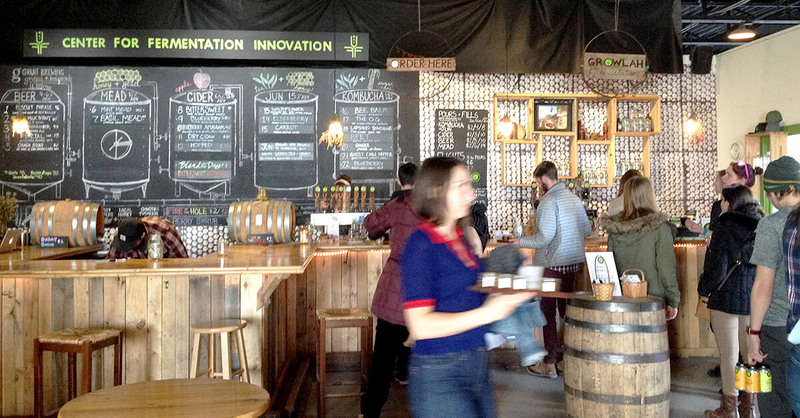 Like most tasting rooms, Oxbow’s is in a warehouse while still managing to provide a welcoming space for the visitor. The Farmhouse Pale Ale (6% ABV) is a delightful, mildly hoppy saison. The other two brews in our sampler were completely new styles to us. The Bandolier (5.5% ABV) is a bière de printemps, a light bière de garde farmhouse ale brewed for the spring, with a lovely malty sweetness providing an opening shot for a tart ride. 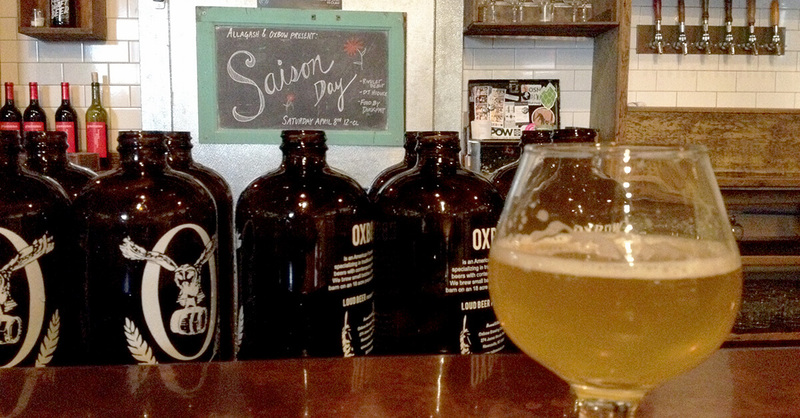 Every day is Saison Day at Oxbow. Grizacca (5%) is a grisette brewed with spelt and dry hopped with American hops, a mild, refreshing brew. Not only would we call Grizacca a perfect gateway drug to farmhouse ales, we learned a bit of history while sipping it. While saisons and bières de garde quenched farmer’s thirst, grisettes came from the mining world (the word means “little gray,” as in stone). Now if you’ll please excuse us, we’re stick around until the grisette revival, driven by Oxbow and other American microbreweries, reaches the Pacific Northwest. Hours: Sunday–Tuesday noon to 9:00 p.m., Wednesday–Saturday noon to 11:00 p.m.
We were excited to go to Peak Organic until discovering that the brewery does not have a taproom or any other public facility to go to. On the flipside, a local rag reported that the brewery was growing, so maybe there will be a place to go with the intriguing concept of organic beer too. For now, you can check out the photos of “peak experiences” submitted by customers on their packaging. Our visit to Rising Tide elicited a lot of reactions: refreshed from a spirited prelude at Maine Craft Distilling next door, we thought of JFK’s quote and tempered the expectations resulting from the buzz the brewery gets around town. Not only were we not disappointed, Rising Tide rose to our top three list of Portland, Maine microbreweries on the strength of their product. 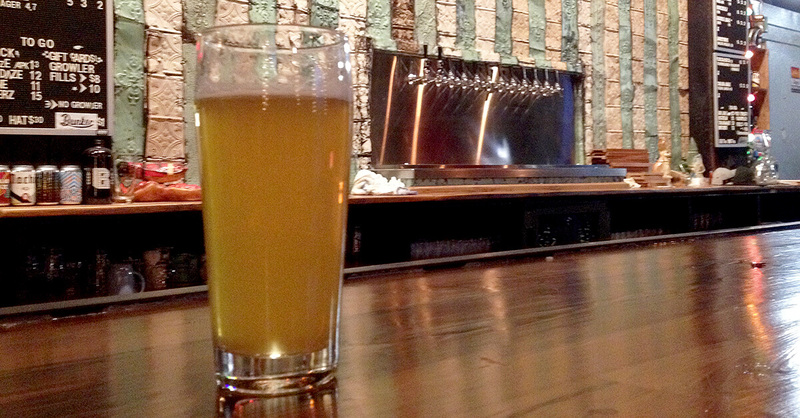 The tap room is a lively, down-to-business space typical of joints fronting a brewing facility. Perhaps a little too loud as the machine hum of the canning line accentuated that of the crowd. We planned to sample more than two of Rising Tide’s excellent brews, but couldn’t hear our own thoughts in the ruckus, let alone focus on the beer. The Atlantis Black Ale (5.3% ABV), a seasonal left over from the winter, is hoppy throughout, roasty around the edges, and wonderful on the nose, but a little hollow through the middle (yes, we couldn’t help but think of the lost continent). Clean in appearance, the Zephyr IPA (6.3% ABV) tastes like the hazy, juicy New England IPAs: big, bold, and boozy. 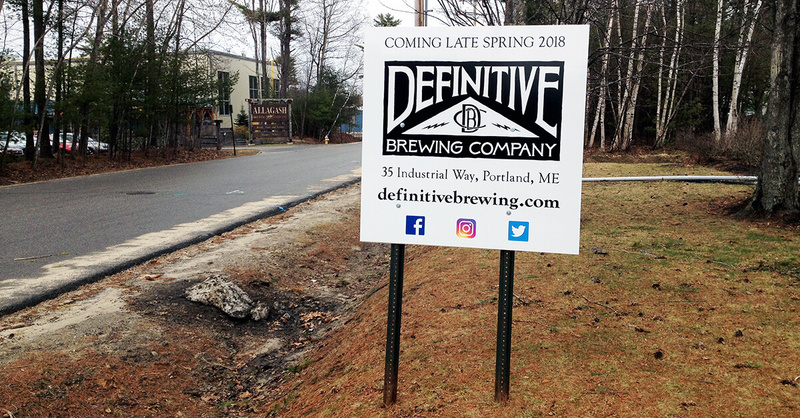 We could tell even from just two brews the people behind Rising Tide love beer (and the community, what with one of the co-owners being a Maine State Representative). Hours: Monday–Saturday noon to 7:00 p.m., Sunday noon to 5:00 p.m.
Breweries in Portland, Maine: Sebago Brewing Co. 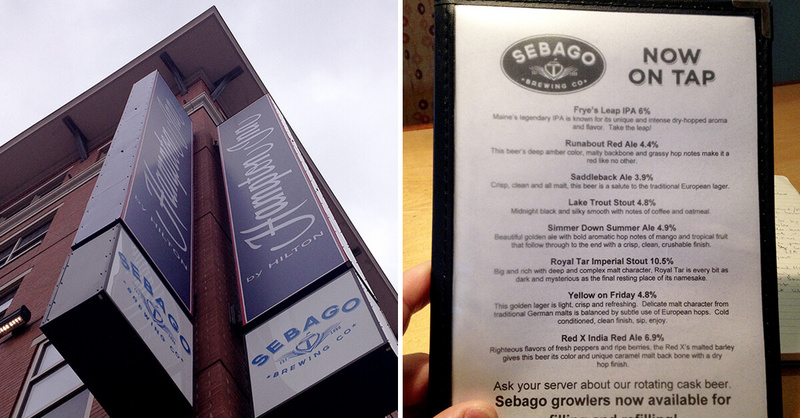 The Portland location of the Sebago Brewing Company is on the ground floor of a Hampton Inn, at the edge of Old Port. No matter how much the disclaimer posted on the entrance door wants guests to not associate the two, you can’t help but feel the place could as well be a hotel restaurant. In the corporate, American-chain-restaurant brew pub, which seems so common to older, more established breweries (Sebago was founded in 1998), nothing really stood out for us, including the beer. The Simmer Down Summer Ale (4.9% ABV) quenched our thirst after a long walk, but we wanted to leave this Anywhere, America as soon as possible to explore more interesting vistas. Not affiliated with the hotel. Not affiliated with the hotel. 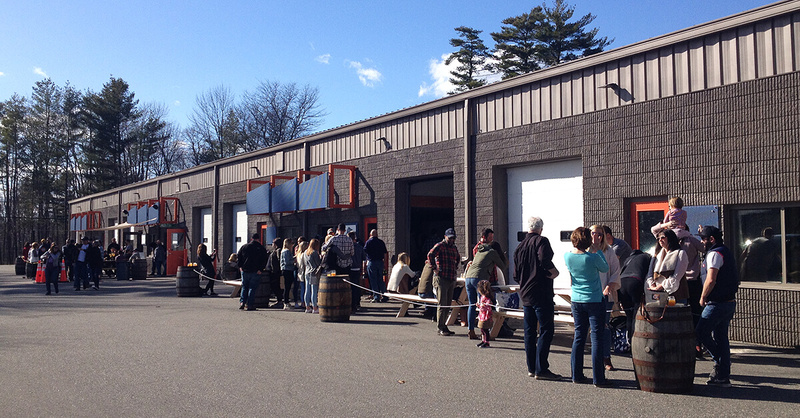 Perhaps we’re an outlier in our lack of enthusiasm for Sebago’s offering: A few days after our 2017 visit, Sebago broke ground on a $5 million expansion of its home-base brewery in Gorham to draw craft beer tourists. 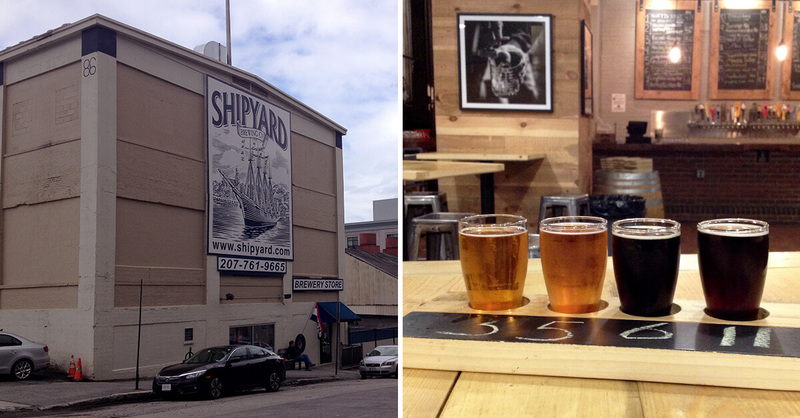 Breweries in Portland, ME: Shipyard Brewing Co. Since it began in 1992, Shipyard has grown to be the biggest brewery in Maine. You can’t miss their name or logo in Portland, as they are pretty much everywhere (and if you do manage to miss Shipyard, they own Sea Dog Brewing as well). They even have their own pub at the airport, the only brewery that enjoys the privilege. Perhaps so as to satisfy as broad a palate as possible, their lineup contains 19 beers, most of which are available in their downtown facility and tasting room. Biggest and baddest in Maine. When you access a brewery’s tasting room through a giant gift shop, no one would blame you for a healthy pint of skepticism. You’ll only be right in part. 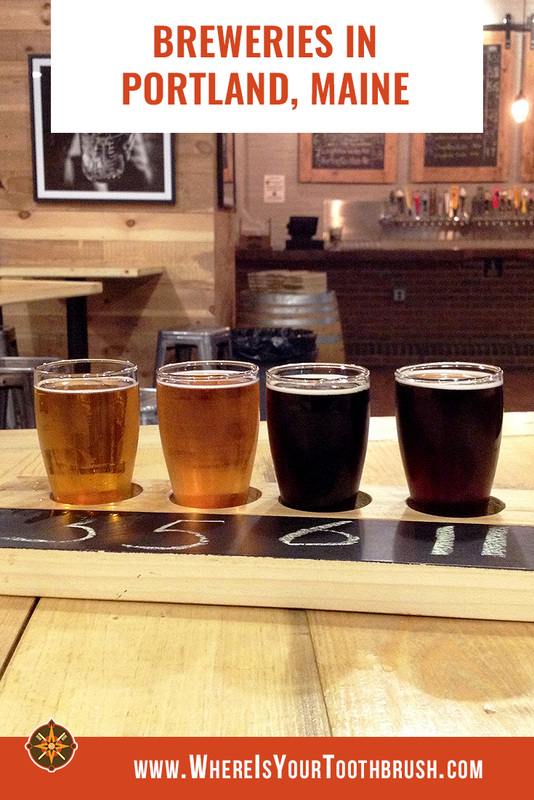 We reaffirmed the benefit of low expectations and were rewarded with a pleasant surprise in our sampler flight. The flagship Export Golden Ale (5.1% ABV), the Coffee Porter (4.5% ABV), and the unique beer & tea fusion Sea Dog Fireberry Tea Ale (4.6% ABV) are all fine, quaffable ales. It was the Bourbon Barrel Aged Smashed Blueberry Ale (11.1% ABV) that blew our mind. A boozy fusion of classic old-country styles, it is intense and complex, with bourbon and fruit notes alternating with the porter base and the distant-land sweetness of Scotch ales. We would have loved to sip the most memorable brew of our trip from a tulip glass while sitting on a dock watching ships go by. Hours: Monday–Thursday 9:00 a.m. to 5:00 p.m., Friday–Saturday 9:00 a.m. to 7:00 p.m., Sunday 11:00 a.m. to 5:00 p.m. When we found out there’s a nanobrewery on an island in Casco Bay, off the Portland peninsula, and that it was only accessible by public ferry, we knew we had to go. We should have done more research about The Inn on Peaks Island, however: It was still closed for the season and wouldn’t open until more than a month after we left, in May. The womp-womp trumpet sound that followed our excitement and the ferry back that we missed by a hair soon faded as we across the island, through spooky trails and swamps and old military installations. 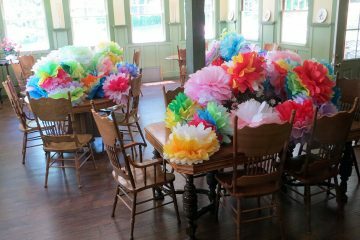 We made a couple of afternoon hours of it, but boy, we could have used a mug of that “cask conditioned ale” beer at the end! 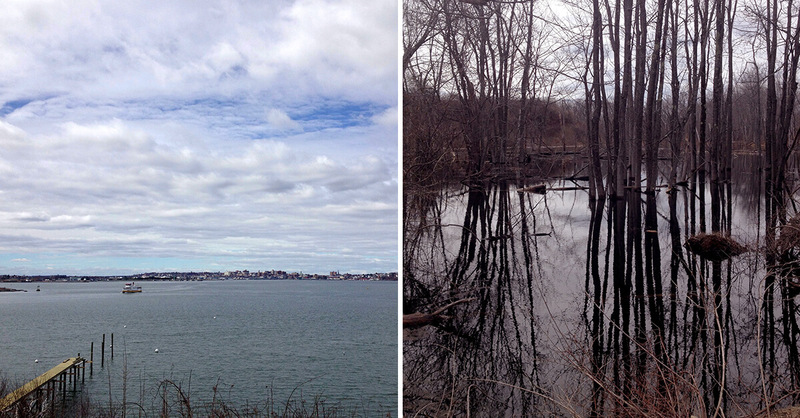 A view of Portland from Peaks Island, and a swamp on the other side. Hours (May–October): Monday–Thursday and Sunday 11:00 a.m. to 9:00 p.m., Friday and Saturday 11:00 a.m. to 10:00 p.m. If you don’t have time for all the breweries in Portland, ME (who does?) or can’t decide which ones to go to (we can’t blame you), go to Novare Res. This alleyway joint is one of the best beer bars in the country, according to the Brewers Association, and hands-down our favorite bar in Portland, Maine. With 33 rotating taps and some 400 bottles on offer, you can sample beer from many Maine breweries. The place gets crowded around communal tables and the bars (thankfully there are no TV screens). But even your introverted reviewers managed to strike up a conversation with a fellow traveler. Nothing like sharing stories about favorite places in Sarajevo, Bosnia or hearing about the intricacies of living in Somalia over strong ales in a brick-walled basement while the coastal wind howls outside. Hours: Monday–Thursday, 4:00 p.m. to 1:00 a.m., Friday 3:00 p.m. to 1:00 a.m., Saturday–Sunday noon to 1:00 a.m.
Abutting Portland across Casco Bay, South Portland is an independent, incorporated city. Four breweries are located in South Portland, making them the best breweries near Portland, Maine. Though it’s only 3 years old, Fore River Brewing’s name comes up in beer-related conversations a lot. For good reason. Were it not for rough-hewn wood paneling and rotating for-sale art on the walls, the tap room, off Highway 1 and Interstate 295, would be just another warehouse. Taps over an old bathtub and a nicely restored fireplace mantle and chimney are a nice nod to the love of things reclaimed. Before you get your beer from a list leaning toward sours, the bartender spotchecks your glass against the light for cleanliness. No matter the beer, the little gesture establishes a foundation for your experience. The East Yard Pale Ale (5.5% ABV) is a bright ale with a wonderful dry-hopped nose, perfect for the crisp sunny day reigning outside. Lygonia IPA (6.5% ABV), made with Cascade and three lesser-known hops, nicely straddles the hazy line with the fabulous, citrusy flavor and cloudy appearance without the juicy heaviness of hazy IPAs. Nicely done. 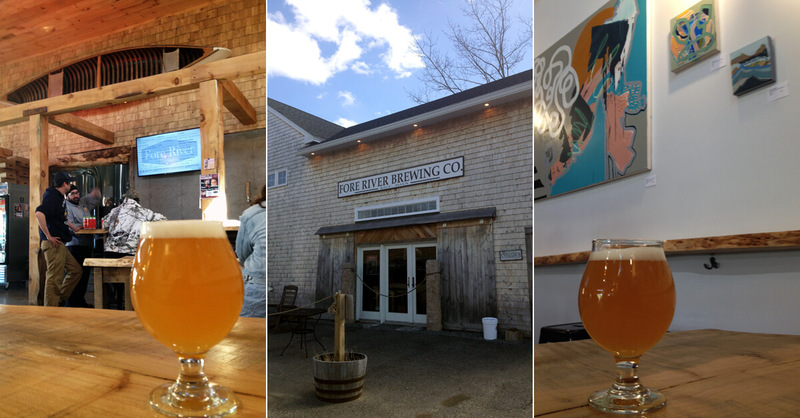 When it comes to breweries near Portland, ME, Fore River stands at the forefront. 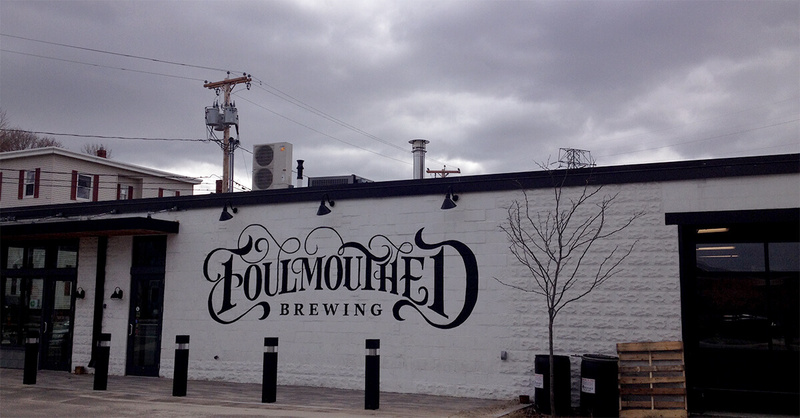 Foulmouthed Brewing is on the other side of Casco Bay, in South Portland. The walk across the busy Casco Bay Bridge isn’t glorious but offers nice views of Portland draped over the peninsula. The brewery has got its branding down, with the black-and-white interior of a converted garage putting a polished face on the clean visuals. One of the more interesting beer lists in all of Portland, Maine made up for the hilariously slow service. Wheat beer aged on cucumbers? Hypothesis #2 (5% ABV). Big lemony IPA? Lemonless Lemonade IPA (6% ABV), to the tune of three Spanish couples cheering with a bottle of bubbly, no less. Before we could get to the saison, stout, or barleywine, we ran out of patience and daylight. Still, we will return to Foulmouthed just to see what the brewers come up with next. We’ll sit at the bar, though. Hours: Monday–Friday 3:00 to 10:00 p.m., Saturday–Sunday noon to 10:00 p.m.
South Portland, too, gained a brewery since our last visit. And, like the breweries on Industrial Way in Portland, Island Dog Brewing, established in June 2017 and inspired by a visit to a microbrewery on a beer bus tour, occupies a warehouse space in a nondescript business park building. 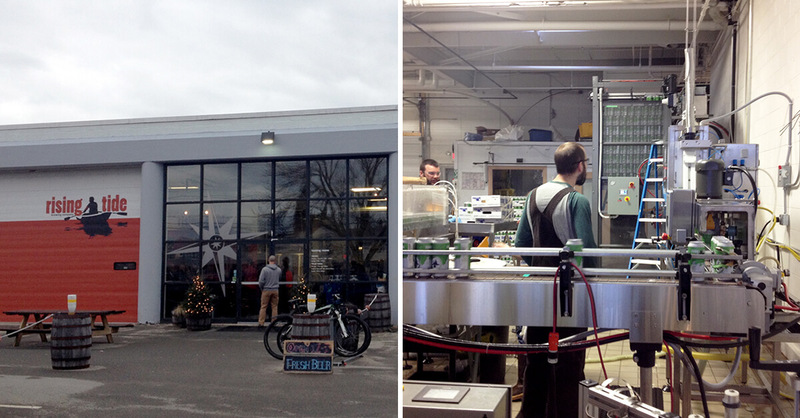 We visited the same Saturday as Bissell Brothers, and the contrast couldn’t have been starker. Where the hazy IPA specialist’s space hopped with crowds of drinkers and can buyers and loud pop rock, Island Dog stood empty and cavernous and mellow with classic rock on quiet (the space does fill up for the various events hosted here, including comedy nights, concerts, and private events). The advantage: the full and dedicated attention of the friendly bartender/co-owner who shared the story behind the brewery’s name (dogs! 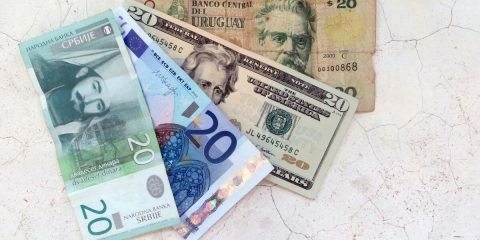 ), the idea behind the business (small and local) and plans for the future (slow and steady growth with self-distribution only). All of the beers we tried met our expectations of each style; they were good but there were also no surprises. Rounding up the beer list were a hazy IPA, a brown ale, a heffeweizen, a farmhouse ale, a Belgian golden strong ale, a red ale, and a dunkelweizen, all of which should also be fine examples of their styles. 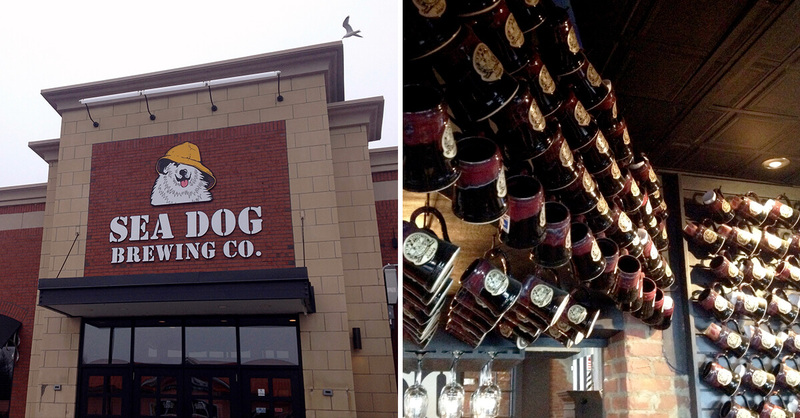 Look for Island Dog’s brews in restaurants around town featuring them as their own, branded specialty beers. Hours: Wednesday and Thursday 3:00 p.m. to 8:00 p.m., Friday and Saturday noon to 9:00 p.m., SUnday noon to 8:00 p.m.
Breweries in South Portland, Maine: Sea Dog Brewing Co. The South Portland location (they have three other locations in Maine, one in New Hampshire, and two in Florida) is in a light industrial area off I-295, and looks just as you would expect from a suburban restaurant. Spacious and a bit impersonal, the place gave us a feeling wecould be anywhere. In breweries like this, which try to appeal to a broad swathe of pub goers (their tagline is “brews for every taste”), we have a hard time picking one brew over another and order flights in hopes of finding at least one gem. In addition, Sea Dog’s beer list features an unusual number of fruit-fortified brews, including Apricot, Raspberry, and Blueberry Ales. With hindsight, the epic flight of 10 we ordered to go with lukewarm clam chowder was the kind of mistake you make at a lunch buffet, where you pile on everything in sight and end up with a stomach ache. The brews, from the Owl’s Head Light Ale (3.25% ABV) and Windjammer Blonde Ale (4.8% ABV), to the two wheats, Sunfish (4.6% ABV), and Bluepaw (4.6% ABV), to the more traditional Old Gollywobbler Brown Ale (4% ABV), IPAs (+/- 6% ABV), Pale Ale (4.8% ABV) and Stout 4.5% ABV), the beers were quaffable, session beers I wished I had on a patio someplace. Our favorites: The Hazelnut Porter (5.6% ABV), a smooth, robust brew with roasted filbert notes, and the Stout (4.5% ABV), whose salty undertones befitted the brewery’s name. 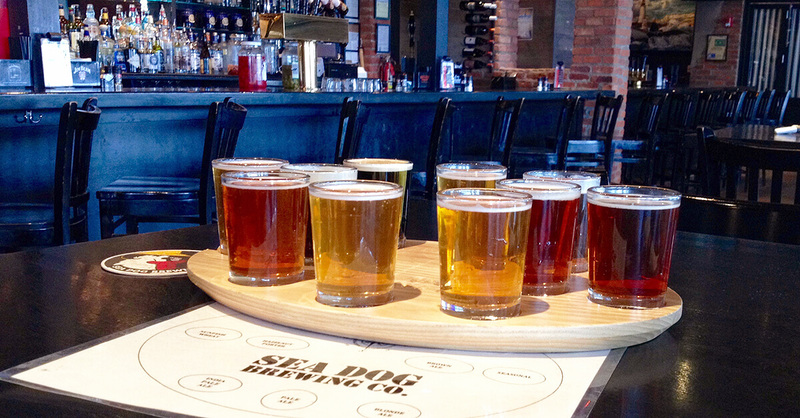 A lunch buffet sampler tray at Sea Dog Brewing. Search for “breweries in Portland” or “Portland breweries” and your results page will take you to Oregon. Yet “the other Portland,” as we call it in “our” Portland, Oregon, even though our fair city got its name from it, is a craft beer lover’s paradise. We came away from our explorations, in April 2017 and 2018, of Portland, ME breweries with a few distinct impressions. This guide to Portland’s breweries was originally published in April 2017 on our first visit to Maine. 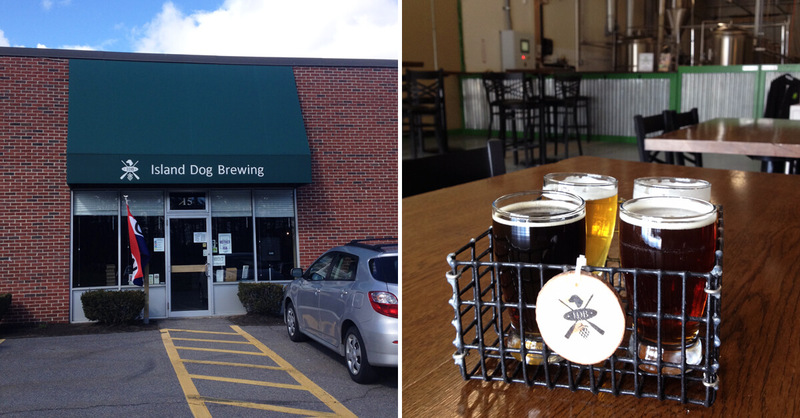 On our second visit, a year later, two new breweries had opened (Battery Steele Brewing and Goodfire Brewing) and one (One Eye Brewing) closed in Portland; and one new brewery opened in South Portland (Island Dog Brewing). In Maine overall, a dozen breweries opened since spring 2017. All of which is to say, craft beer continues its rise in the Pine Tree State, including in its biggest city, defying the national flattening trend. The working title of the original version of this guide to Portland, ME breweries was, “How to visit 10 Portland, Maine breweries in 3 days.” The solution: on foot. Portland, Maine being a small town, it is possible to visit most breweries on foot. The 12 breweries on the Portland peninsula are all within walking distance, with three miles separating the furthest breweries (Bissell Brothers in the southwest and Goodfire Brewing in the northeast); you can combine the 5 (soon to be 6) breweries out on Industrial Way into a single tour or brewery hop. You can hone your walking and drinking skills touring breweries in Portland, ME, but be careful on those undulating brick sidewalks on the peninsula. In Oregon, beer-trail type initiatives stay on the local level, e.g. Bend Ale Trail, Eugene Ale Trail, or North Coast Craft Beer Trail, and promotion efforts focus on festivals, especially in June and July, the Oregon Craft Beer Month. Considering the sheer number of breweries, steady market growth, and particularly excellent reputation, perhaps there’s less of a need to promote Oregon beer. To us, the Maine Brewer’s Guild does a better job than its Oregon counterpart—in some ways anyway. The Maine Beer Trail map helped us plan our tours, and you can see us wearing our reward hat soon. In short, if you want to know what breweries Portland, ME has to offer, go with the current edition of the Maine Beer Trail Map. Maine works hard to promote its beer outside the state and even abroad, e.g. with the Maine Beer Box, a shipping container retrofitted to serve 50 Maine beers around the world (in Iceland in April 2017, in Maine as of March 2018). 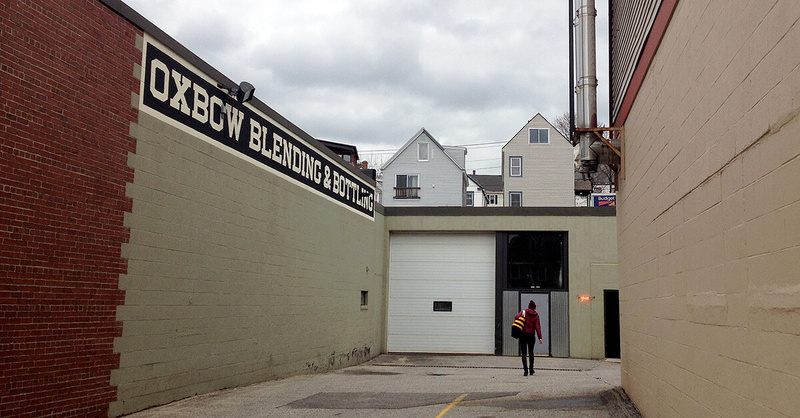 Most microbreweries we visited in Portland, Maine only have a tasting room, attached to the brewing facility itself. That there are so many testifies to the vigor of the local craft beer market. But with limited opening hours (Tuesday and Wednesday are popular off-days) and no food served (some breweries sometimes host a food cart/truck outside), visiting these breweries requires a bit of advance planning so you don’t turn up hungry or when they’re closed. 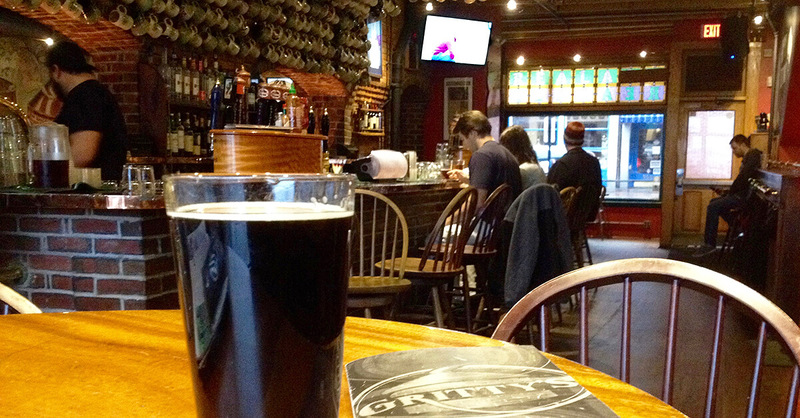 Destination breweries with brew pubs, like Gritty’s or Sea Dog, are comfy places to enjoy a few pints and classic pub grub. Unlike in the West Coast Portland, the English-style fare and seafood stand out. Brewers in Maine seem to focus much less on hoppiness than those in Oregon. We could not see IBU (International Bitterness Unit) values listed anywhere as is the standard around the Pacific Northwest. It being New England, English styles are much more common in Portland, Maine, and there is a strong current of Belgian inspiration. We tried to avoid drinking the kinds of beers we already knew from the West Coast, e.g. the American pale ales and IPAs. As a result, we found Maine microbrews to be lighter in body than we are accustomed to. It was unsettling, even frustrating at first, as we kept wondering where “the middle” went. But once we shed our conditioned expectations, the beer drinking experience became more subtle and challenging. And the bigger brews still pack a punch. While initially the West Coast IPA style seemed to be a thing in Portland, Maine in a similar way the New England IPA was a thing in Portland, Oregon, the fad did not last. Hazy/East Coast/New England IPAs continue their ascendance here. In case it isn’t clear from the article, we are no fans of the style, but at least here, unlike in our Portland, it’s local—and we can’t argue with that. At the same time, many breweries, even those specializing in East Coast IPAs, now feature a Pilsner in their lineup, balancing out the heavy brews. The style became popular in the hot days of summer 2017, and we hope it’s more than a fad because there are some good Pilsners out there in Portland, Maine. We’ve updated this Portland, Maine breweries map for 2018 (let us know in the comments if we missed anything), and note that what you see is but a small portion of the larger Maine brewery map. 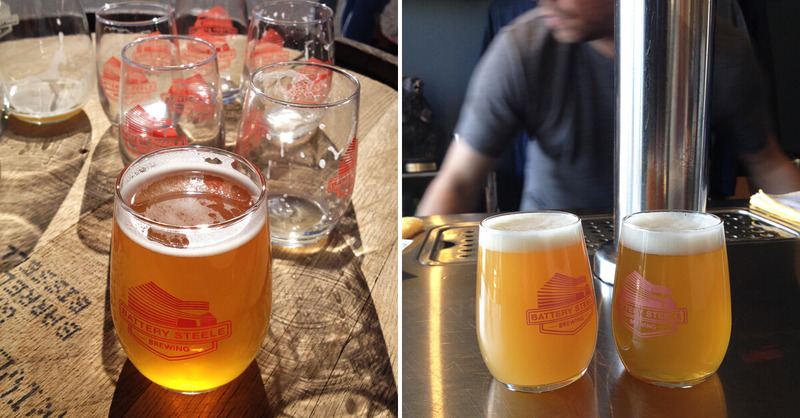 Have you been to any of these microbreweries in Portland, Maine? Which is your favorite and why? Wow, this is like a mini encyclopedia about breweries in Portland! Although as I read I kept doing a double take because I of course kept thinking about Portland, Oregon. 😉 I am sure this post will help many Maine visitors! What a great and comprehensive guide! Thanks for sharing! Portland is great for craft beer lovers. I also recommend trying some of the rural, off-the-beaten path Maine breweries (https://www.gonomad.com/6380-maine-culture-through-craft-beer). Portland is one of my favorite cities but I’ve not done any of the breweries there. The brewery scene was still pretty new the last time I was there – so I guess it’s time for another visit! Thanks for this terrific rundown! My husband and I try to visit Maine at least once a year but we have never checked out their breweries. I am a porter fan but am always excited to try out other offerings … I love beer flights! I’m bookmaking this for our next trip down east. Thanks, Cherri. There are plenty of porters to go around. I don’t drink Beer, but I can appreciate a comprehensive article! I love the food breweries often have some of the best veggie burgers ever and beer cheese! Okay, hungry! Thanks, Victoria. Only a few of the Portland, Maine breweries serve food, so pick carefully. Thank you for such a complete and elaborate guide . Though we dont drink beer I would love to check out a few of these breweries ! When I first read your title I read Maine, but my brain saw Breweries and immediately assumed Oregon. 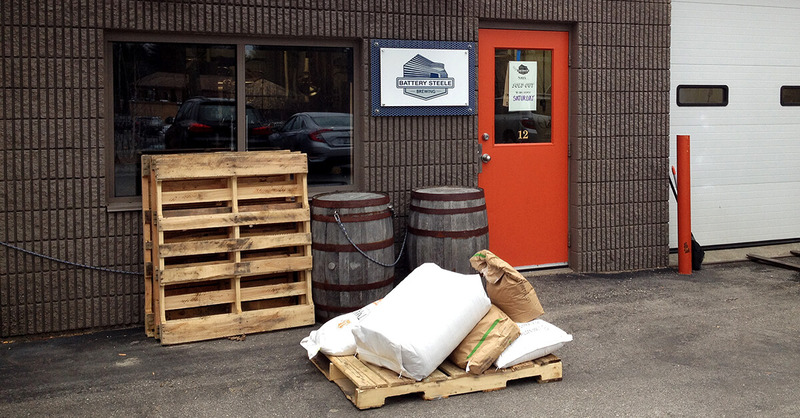 It is great to see such a wonderfully diverse micro/nano brewery culture in Maine, we are just starting to see some great nano breweries here in Calgary which is my home town. For Father’s Day we visited 2 great small breweries. If we are ever in Portland, Maine I will make sure that I give myself a few extra day so that I can visit some of these fabulous places but with so many it will be hard to choose which one to visit first. Nice, the craft beer movement is sweeping across Canada, too! 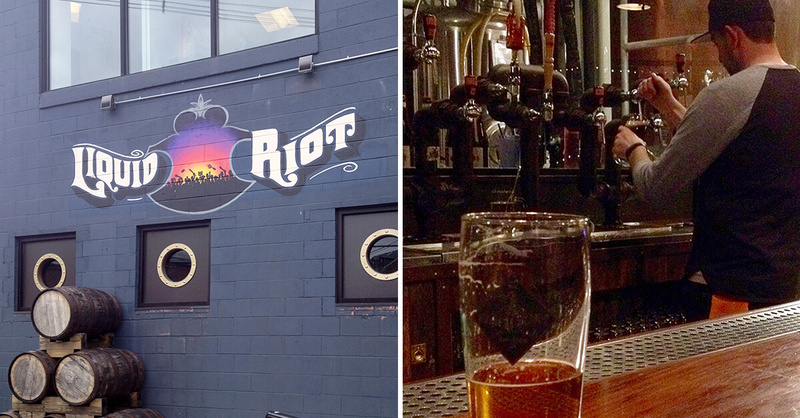 In Portland, Maine, I’d start with Liquid Riot. Who new there was so many breweries in Portland!! You learn something new everyday. Wow! What an interesting and extensive list of breweries in Portland! We’ve never been there, but will certainly visit a couple of the breweries you’ve mentioned here when we go to Portland. Wow! Who knew? So many choices in Portland, ME. I knew the other Portland was a big craft brew town. Now we’ve got both coasts covered. Indeed, when I first researched Portland, Maine I was shocked (in a good way). Thanks, Saakshi. Share share share! This is super comprehensive, thank you! I have yet to visit Maine, but it looks like I have yet another reason to go. I did not know Portland has so many breweries! Thank you for such a comprehensive list! I would love to try Samara Maple Brown Ale if ever have a chance! Yes, it’s not the best known fact. Oregon’s Portland tends to hog the limelight when it comes to beer. Amazing guide! I cannot believe you managed to visit 12 breweries in just 3 days. I love beer so a visit in Portland is a must!!! Yes, it did require serious dedication and fortitude. 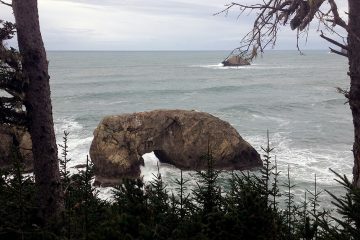 I hope to go to Portland some day. I had no idea the craft beer scene was so big there. But I guess it’s getting big almost everywhere. I live near Branson, Missouri, where the Moonshine business is seeing a revival. Looks like a fun place! Oh man what an amazing comprehensive guide! We’re from Vancouver and we LOVE craft beer – we seek it out everywhere we go in the world. 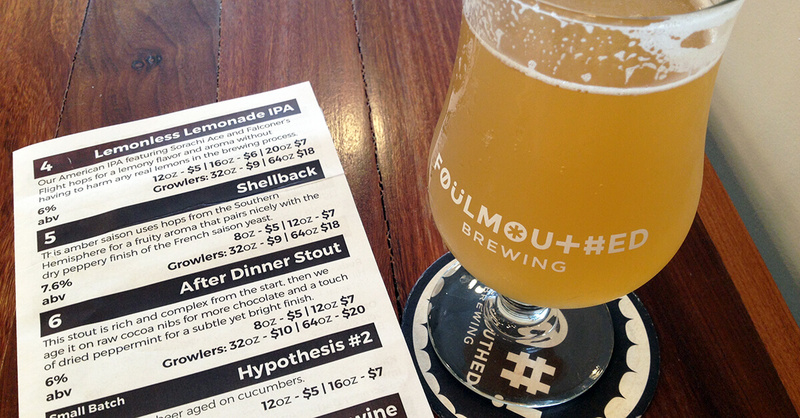 It looks like the beer scene in Portland, Maine is even better than Vancouver. We’ll have to get there soon to get our drink on! I look forward to your report. Cheers! What a great resource! I love breweries and we are stouts and porters people. Here in FL, we usually are stuck with wheat and pale ales. I can’t wait to plan a New England trip! 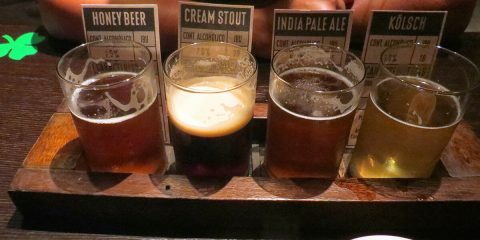 I was never a big fan of beer until I got to Portland, they had a lot of different kinds of beer I found several that I liked. I’m glad I tried it. Nice, you’ve experienced a true conversion. Congrats! Once again another great article spreading the good word of Portland…And, while discussing craft beer! Awesome!! Haven’t been to Portland yet but will definitely look back on your article for some breweries to visit when we do go there. Thanks for sharing! When I read the title, I thought this was a guide for Portland, Oregon and was kicking myself for not having found this before my visit there. Seems like I’m wrong though. Definitely bookmarking this for when I do get a chance to visit Portland, Maine. Thanks for sharing!! Thanks, Jas, it’s an easy mistake to make. Cheers! Wow. What a great guide this is about brewberries in Portland. You’ve put a lot of effort into this and thank you for educating me on this Portland, too which you call “our” Portland. I only knew about the other Portland which instagram and tumblr go gaga about. Wow, I had no idea there were so many craft breweries in Portland, Maine! What a great way to explore the region and quench your thirst at the same time. Great details to plan a beer tour. Thanks, Natasha. Enjoy Portland, Maine! Now this is my kind of guide! I had no idea there were so many breweries in Portland. Now I know I must make some time to visit. I do love a good ale! You bet, Claire. I write (and drink beer) to please. Cheers! I have heard good things about the breweries in Portland and it’s good to learn about them. I could spend many nights / weeks in Portland tasting the different beers with my Dad. I like how many of the breweries offer a good selection of eating options. I like the sound of the BBQ at Salvage. You’ve photographed the beers wonderfully, you make me want to go out for a beer right now! Thanks, James. I hadn’t heard much about breweries in “the other Portland”, except for maybe Allagash. It was a lot of fun to do the research blind like that. Enjoy! My husband would love this; he’s really into craft beer! Personally I’d prefer one of the fruit flavoured ones from Sea Dog. This is such a detailed post – definitely saving for a future trip to Portland. You are definitely a beer connoisseur! This is a very detailed post. I would highly recommend this to anyone who also loves beer more than anything. The lunch buffet sampler tray looks good but where is the food? I don’t drink beer but I love this post! My husband loves great beer and I love to plan in a few brewery visits and great beer bars in our travels. We will likely visit Portland at some point since I have a few friends there. 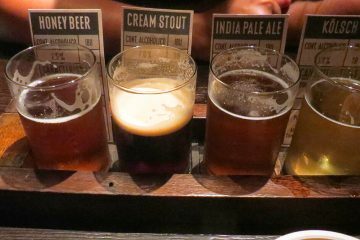 Knowing the style of beer a brewery does is so helpful to choose which ones to visit! Quite the impressive guide to breweries in Portland, Maine. Craft beer seems to be a growing scene just about everywhere. I don’t drink beer myself unless it’s more of a Radler (or juice like beer). But for any craft beer lovers, this is your guide. 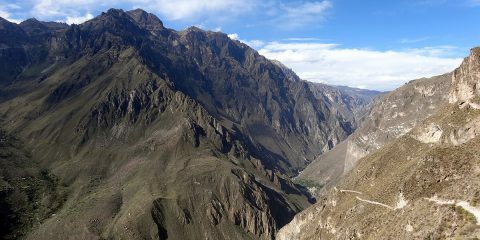 You would need plenty of good food to go along with this 3-day tour. Holy hell, I did not imagine such a comprehensive and thorough list. A buddy of mine just moved to Portland, so I’ll be passing this along to him as well! Thanks for spreading the word, Josh. Thanks, Archana. 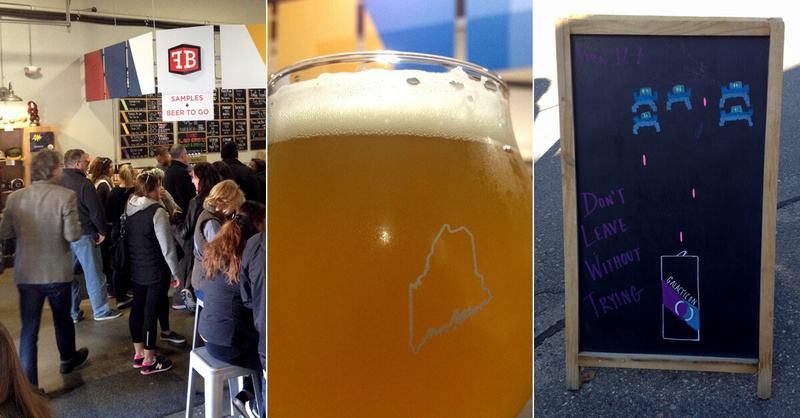 Hope you get to visit and enjoy some Maine craft beer soon! What a truly comprehensive guide to breweries in Portland! I’m not much of a beer drinker myself but I know that your list will get hubby all passionate about going on a brewery-designed holiday! Your guide will come in handy, thanks! Thanks, Jolene. Glad to hear it (the second part, perhaps all these breweries will help you come around to beer). Sounds like Boothbay Craft Brewery’s Route 27 Lager. Cheers!